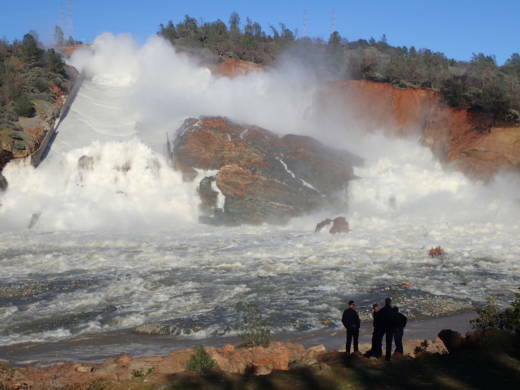 Engineers at Oroville Dam are dialing back the volume of water tumbling down the dam's crippled main spillway. They hope this will will be the "last spill" on the enormous concrete chute before work on replacing it can begin in earnest. But much like the spillway itself, faith in the ability of the agency managing the project is showing some cracks. "This is an institutional failure," says Ron Stork of Friends of the River, at a recent legislative oversight hearing. "That dam has not been safe since it was constructed." Stork is partly referring to the Dept. of Water Resources' choice to build the dam's emergency spillway with no concrete reinforcement. Massive erosion on the bare earthen slope is what triggered mass evacuations in February, when weeks of heavy precipitation pushed Oroville Lake over the rim of the spillway, threatening a potentially catastrophic flood. But maintenance of the dam since its completion in 1968 has also undermined faith in the department. "The inspections over the years have been cursory," says State Senator Jim Nielsen (R-Tehama). "That's very alarming." Nielsen and fellow legislators from both the senate and assembly seem to have drawn little comfort so far from a series of oversight hearings at the Capitol. "It gets to be more disturbing, the more information that we get," says Nielsen, who recalls asking how often core samples were taken at the dam site to check the integrity of the spillway structures. "When I ask the question, 'Have you been doing boring,' and I get a boring look back, that scares the heck out of me." DWR has admitted that the vast majority of inspections were "visual," and that maintenance recommended by inspectors wasn't always performed. "Whatever has gone on before -- obviously -- in terms of the inspections, has not been sufficient, by any reckoning," says Nielsen, who is looking into a reorganization of the agency that inspects state dams. The Division of Safey of Dams is currently nested within DWR. "The California Water Code entrusts this regulatory power to the Department of Water Resources which delegates the program to the Division of Safety of Dams." Some lawmakers suggest that wresting control of that office from DWR might make give it more clout, though state resources chief John Laird has defended the current regime. "I think it is fair to say that California has what independent experts consider the strongest dam inspections program in the country," he told legislators last week, "but it's obviously clear that we can do better." Nonetheless, some have suggested that Oroville might be better managed in the hands of another entity entirely, though it's unclear what that might be or how such a transition could occur. "It's at least a question that we should have," says Assemblyman James Gallagher (R-Yuba City), who was one of more than 180,000 ordered to evacuate along the Feather River in February. "Is this the best agency to be operating the dam up there?" Other dams in California are operated by the federal Bureau of Reclamation, Army Corps of Engineers, and in some cases, local water authorities. "No matter who operates it, there needs to be a change in the process up there," says Gallagher. "To me, this didn't happen because of Mother Nature," he adds. "It happened because of organizational issues and things that we did not do in design, construction, and in our maintenance and operations." DWR's acting director Bill Croyle is promising a full "forensic" review of the February incident sometime this fall. An extremely preliminary three-page report issued last week by a team of consultants listed an array of possible contributing factors, ranging from thin or inconsistent concrete thickness on the main spillway, to weak, weathered rock on the emergency spillway (see our April 7 story on the geological flaws and Dan Brekke's April 18 story on potential causes for the spillway collapse). "We don't have all the answers," Croyle told lawmakers. "We don't know why it failed yet. We won't know for a while." Even so, DWR is surging ahead with the reconstruction, racing to have a workable spillway in place before the rains return in November. Even while recognizing the urgency, some lawmakers are uneasy with a fast-track construction program before the final failure analysis is in. Assemblyman Jim Frazier (D-Oakley) seemed to sum up the trepidation. "We did it wrong 50 years ago," he said. "Now we're paying for it. Let's do it right this time."